Rev. William Donald "Don" Knight, Sr.
1 tree planted in memory of Rev. 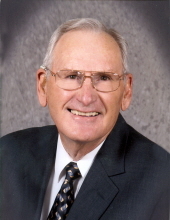 William Donald "Don" Knight, Sr. Celebrating the life of Rev. William Donald "Don" Knight, Sr.
Obituary for Rev. William Donald "Don" Knight, Sr.
Funeral services for Rev. William Donald “Don” Knight, Sr., 84 of Lancaster, will be held at 11:00 o’clock a.m. Tuesday, February 12, in the sanctuary of Kershaw Second Baptist Church, Kershaw. The Revs. Phil Latta and Ronnie Hinson will officiate. Burial will follow in the Mt. Pisgah Baptist Church Cemetery, Jefferson. Rev. Knight died Saturday, February 9, in White Oak Manor, Lancaster. Born in Lancaster, he was a son of the late Andrew Jackson ”Drew” Knight and Faye Blackmon Knight. Rev. Knight served his Lord as a Baptist minister for over 50 years. He served numerous congregations in North and South Carolina. He also served his country in the United States Army. Surviving are his loving wife of 62 years, Phyllis June Fowler Knight of the home; his son, William Donald “Bill” (Rita) Knight, Jr.; 2 grandsons, William Christopher “Chris” (Brittany) Knight and Derek Ray Knight; 3 great grandchildren, Hunter Jackson Knight, Zayden Spinks and Isabella “Izzie” Knight; a brother, Jack (Earlene) Knight and 3 sisters, Dot Murphy, Shirley (Bob) Allen and Nancy Williams. In addition to his parents, he was preceded in death by a daughter, Deborah June “Debbie” Knight and 3 siblings. The family will receive friends, Tuesday, February 12, prior to the service beginning at 10:00 o’clock a.m. at the church and other times at the home. Memorial contributions in memory of Rev. Knight may be directed to Kershaw Second Baptist Church, 7737 Kershaw Camden Highway, Kershaw, SC 29067. Baker Funeral Home, Kershaw is serving the Knight family. To plant a tree in memory of Rev. William Donald "Don" Knight, Sr., please visit our Tribute Store. "Email Address" would like to share the life celebration of Rev. William Donald "Don" Knight, Sr.. Click on the "link" to go to share a favorite memory or leave a condolence message for the family.